In a previous Khushab Update,1 the Institute identified major new construction in the southwest corner of Pakistan’s Khushab Plutonium Production Complex (also known as “KCP”). This construction was most likely being done for a new coal-fired thermal power plant to augment the electric power requirements of the complex. Recently acquired commercial satellite imagery from March 2018 now confirms that assessment, as does corroborative information gleaned from open source reporting. In the last Khushab report released by the Institute in September 2017, we addressed the issue of the ongoing construction as possibly being the early stages of a tritium extraction facility. However, we also suggested that the construction was more likely for a coal-fired thermal power plant. Now that construction of the facility is almost finalized, it is even more evident that the facility under construction is indeed a twin-boiler coal-fired thermal power plant (TPP). Information published by the Pakistani Atomic Energy Commission (PAEC) underlines this conclusion. The Institute was able to find information on the coal power plant in a public notice,2 a Generation License,3 and a press release,4 dated March, August, and September 2017, respectively. 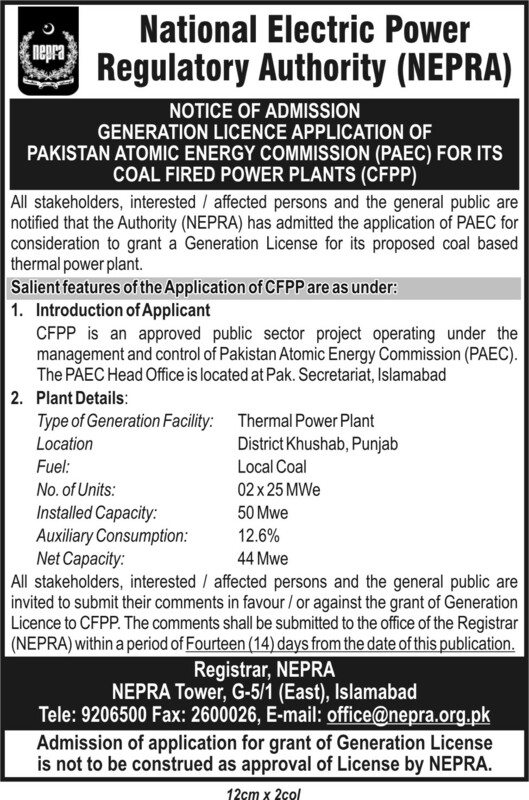 The Generation License granted by the National Electric Power Regulatory Authority (NEPRA) is addressed to the Deputy Director at PAEC, Muhammad Iqbal Khan, and specifies the coal plant as “50.00 MW Coal Fired Plant located at KCP Complex, Jauharabad, District Khushab, in the province of Punjab.” KCP seems to be the name PAEC uses for the Khushab nuclear complex, although it is not clear how the acronym precisely translates. According to the press release, most of the electricity generated by the coal plant will be used by PAEC for the operation of KCP and “only occasional surplus will be supplied to the utility/FESCO.” As all four reactors at Khushab are plutonium production reactors and not power reactors, they require electricity to be operational, including two independent sources of electrical service for reactor safety purposes (based on IAEA guidelines following the Fukushima nuclear incident in Japan). The main user of the electricity generated by the coal plant is believed to be the Heavy Water Production Plant, however. According to the Generation License, the coal power plant was set to be operational by December 31, 2017 and to have a lifespan of thirty years. The electric power sector of the country is experiencing a supply- demand gap. Due to the shortage of electricity, the utilities are finding it hard to meet with the requirements of its consumers especially industrial concerns. In order to cope with the above mentioned situation, various industrial concerns are contemplating to set up generation facilities using cheaper resources for supplying to their industrial concerns. To meet the electricity requirement of its KCP complex located at Jauharabad, district Khushab in the province of Punjab, Pakistan Atomic Energy Commission (PAEC) planned to set up a 50 MW indigenous coal based generation facility/Thermal Power Plant. The approval, dated August 31, 2017, provides additional details including that the plant would consist of “two (02) Boilers (98 bar and 540°C), two (02) steam turbines and two (02) synchronous generator units. The boilers will be fed using the local coal of the salt range mines which will be supplied and transported using trucks. In view of the size of the project and possible source of coal PAEC has selected Circulating Fluidized Bed (CFB) coal boiler.” This information is entirely consistent with what is discernible about the plant in commercial satellite imagery. The twin boilers are clearly visible and the coal receipt and transfer building is only accessible by road; there are no rail lines to the plant to allow transport of coal to the plant by rail. Further, the approval states, “PAEC has confirmed that underground water at site will be the main source of supply for the proposed generation facility/Thermal Power Plant. In this regard, deep well turbines will be set up to pump the ground water.” The approval also stated that the TPP would be connected by a “132 kV Double Circuit (D/C) transmission line (Measuring about 3-KM in length on ACSR Lynx Conductor) connecting the generation facility with existing ABC Girote grid station,” operated by the Faisalabad Electric Supply Company (FESCO). The new power line, which the Institute highlighted in the last update, visibly connects the electrical substation at the TPP to the main electrical station near the Heavy Water Production Plant. Using Google Earth, we could confirm that it measures very close to the reported three kilometers. Although the Generation License provided the expected date for completion of the plant as December 31, 2017, based on the available Airbus imagery from late March 2018, PAEC does not seem to have met this deadline. The plant does not yet show any visible signs of being operational, such as smoke emissions released through the stack, or even a single coal delivery. Nonetheless, the TPP is very close to completion. This is shown in figure 1. Figure 1 also shows that the design of the coal power plant can be directly compared to the typical design of a coal plant, as shown in a generic commercial scheme. Major components are now visible and are annotated in the figure. Figures 2 and 3 show the coal-fired TPP in relation to the heavy water production facility. Figure 2 is an overview of the whole Khushab Plutonium Complex, which includes four plutonium production reactors. Figure 3 shows the now identified, double 132-kilovolt (kV) electric power line connecting the TPP to the main electrical substation adjacent to the Heavy Water Production Plant, covering the reported three kilometers. Figure 1. The 50 MW coal-fired power plant missed its December 2017 deadline for completion but seems to be nearing completion. Figure 2. An overview of the Khushab Nuclear Site in Pakistan. Figure 3. The TPP is visibly connected to an electrical substation by the Heavy Water Production Plant.